For Heidi Hollis, her company name of Citico Ridge Bears, originates from the nearby mountain range where she currently makes her home in Tennessee. The ridge also happens to be a protected bear reserve consisting of several thousand acres. As an advocate animal lover, Heidi especially loves bears. Heidi's earlier recollections of having a teddy bear are tied to memories of her grandmother. "My grandmother was a very 'can do' kind of person. She was my inspiration." Although her grandmother wasn't the stay-at-home type, she did find the time to make Heidi costumes for Halloween and a raggedy bear once. "I no longer have that bear, but I will forever cherish the memories of it and think that's probably why I am so drawn to bears." Knowing that the likeliness isn't very good that she might be able to touch, hug or snuggle real bears, something about the magnificent bear feels safe and humbling and on some level, identifiable to her. 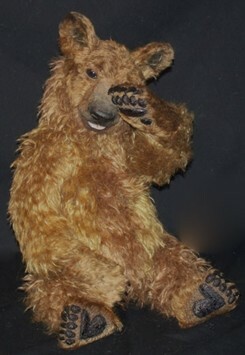 When she was younger, Heidi designed and created bears and other animals as a hobby. With a fascination for any kind of art, whether it be painting, drawing, or sculptures, her passion was clear; bears! So she combined her love of art with bears and this passion finally lead her to creating soft sculpture bears. "When creating a bear, one of the most important aspects besides the look, is the durability." She puts no deadlines on finishing her creations. They are done when she is completely happy with the results. "I love the realistic-style artist's bear, so I make my bears on a larger scale, usually 18-32" in length and a nice fat girth." Since Heidi ships her bears to other countries, which can be quite expensive, every once in a while she'll create a smaller bear. "I would, however, love to create a true to size adult bear someday!" Almost every bear is created with 6 joints, sometimes as many as 10 joints and armatures are used too. "I just love the realistic poses you can achieve and with the use of the loc-line armatures, you can be sure that the limbs will not shift out of place. They are extremely secure." She's is also working on some new techniques for posture and movement. For the nose and claws, Heidi uses an epoxy based clay, which she finds a much stronger consistency than a Fimo-type clay. Muzzles are almost always needle felted, as are the paw pads. "I use a special technique for the realistic look I get for the paw pads and lip area." This makes them a permanent part of the bear; not merely affixed. As a self-promoting artist, Heidi sells mostly online through auctions and has been doing more commissioned bears this past year. "I feel I will get caught up in the assembly line feel of things if I try to do too many." Mass production doesn't yield her the same allowance of time or give her the same gratification unless she's doing free style sculptures. Heidi loves new challenges. "I have just started to put things together to create my first gargoyle. It's been a long time waiting and I am extremely excited. Although I will never stop creating bears, I want to create some new and really challenging things." Bear making has added a whole new dimension to her life. "Although it is a blessing to work alone, which can at times be hard and takes a lot of discipline and focus, I am a social person and love to be around people." Heidi finds the teddy bear industry lends itself to this kind of personal connection. "It is much more on a personal level, when you get to know and enjoy your clients. The people I have met along the way have all become friends, mentors and some, I would even consider family." "It seems that for some reason, people that collect artist bears and soft sculptures are the most loving, caring and genuine people this world. This industry has given me the opportunity to learn about different cultures and from that, I have friends from all over the world. I love it!"